Will LiFi Take Big Data And The Internet Of Things To A New Level? The enormous demand for WiFi and transmissions of mass quantities of data is putting a strain on the current technologies. With the predicted exponential growth of mobile devices, by 2019 more than ten billion mobile devices will exchange 35 quintillion (1018) bytes of information each month — and that’s just mobile devices. Factor in traditional computers, big data servers, and Internet of Things devices and you start to see the magnitude of the problem. But scientists have discovered a method of data transmission more than 100 times faster than traditional WiFi, and it only requires that you turn on a light. LiFi is a category of Visible Light Communication; an LED light flickers at speeds undetectable to the naked eye to transmit data — a bit like high tech morse code. In fact, scientists have demonstrated in a lab that they can transmit information at as much as 224 gigabits per second, the equivalent of 18 movies of 1.5 GB each being downloaded every single second. In an office setting, they were able to achieve speeds up to 100 times faster than average WiFi speeds. The LED lights require so little energy, they can be powered by a standard ethernet cord. Inventor Harald Haas has also suggested that the smart lights could be powered by solar cells charging batteries. In addition, LiFi does not create electromagnetic interference the way WiFi does, meaning it could have important applications in sensitive locations like healthcare facilities. There are, of course, drawbacks. In very bright daylight, the receivers wouldn’t be able to distinguish the signal, and unlike WiFi, LiFi signal cannot pass through walls. Of course, these limitations could be overcome with technologies like smart architecture where the light follows the user around the space. Algorithyms will determine our lighting and access to data more and more. And actually, the fact that LiFi cannot pass through walls makes the data stream instantly more secure; users must be physically in the space in order to access the data. 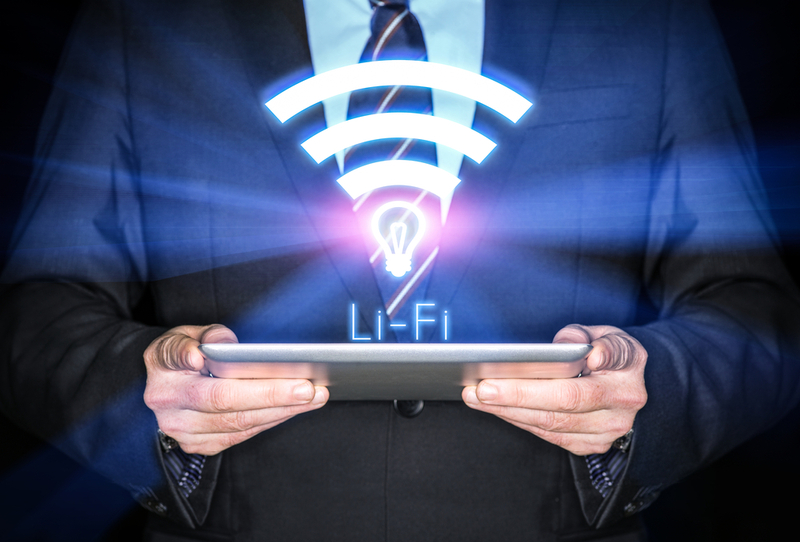 In addition, LiFi could be installed anywhere users might like light and data services: bus shelters, train stations, street lights, tourist information kiosks could all provide data transmission as well as light. As the market for IoT devices grows and sensors are added to more and more things and places, faster and heavier data transmition will be required. Our current infrastructure simply cannot handle the quantity of data that will need to be transmitted if the IoT continues to grow at predicted rates.